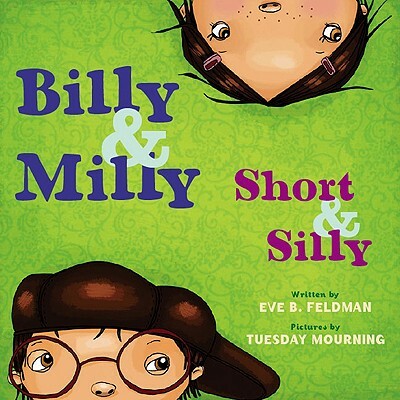 Book of the Week: Billy and Milly, Short and Silly! I was so delighted to find this adorable book today that I had to write about it immediately! I scored a great deal on it at a bookstore, and it is very inexpensive on Amazon as well. A compilation of thirteen very short stories, most with only four words, paired with dynamic illustrations. For example, Stoops (the characters sitting on the front porch), Hoops (Billy is shooting his basketball), Scoops (Milly is licking her ice cream cone), Oops (when the ball lands on her ice cream cone!). A big award winner! Check out the Facebook page for a nice summary of awards and reviews. Hilarious stories and engaging pictures will delight kids and keep their attention. Provides a playful introduction to rhyming for kids that may not understand or care for traditional poems. I can see this book working really well as a whole class push-in or small group pull-out lesson. There are tons of ways to use it in treatment! Read the first story and introduce the topic of rhyming. After reading each story, have the kids come up with other words that rhyme. Although, be sure to save the generative rhyming for story #2… The first story rhyme is with “stoops” – Heaven forbid one clever child come up with “poops,” and your entire lesson goes out the window! Use the book like a wordless picture book to generate narratives. This book is an excellent tool for eliciting past tense constructions at the structured discourse level. Challenge the kids to create their own 4-word stories and illustrations. There are some great examples over at the WebsterHill Library Media Center blog. Grab a summary of these ideas on my Billy & Milly companion card here (An index card with a summary of uses for the book in therapy, to adhere to the inside cover). I try to make one up for all the books I use in therapy because I have a terrible memory and want to have quick access to these ideas when I’m doing last minute session planning! Have you used this book in your lessons? Can you think of any other uses for it?